This is a rectangular Sentinel Motor Oil porcelain sign. This particular Sentinel Motor Oil sign is predominantly white with yellow and black text. 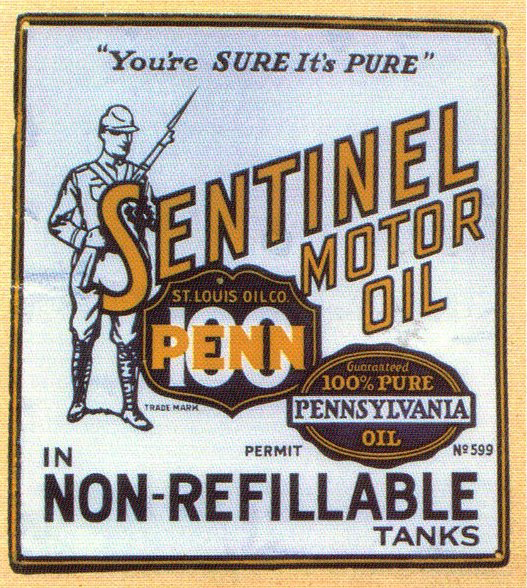 It reads, “You’re Sure It’s Pure, Sentinel Motor Oil in Non-Refillable Tanks, St. Louis Oil Co., Penn 100, Guaranteed 100% Pure Pennsylvania Oil, Permit No. 599” and features a soldier holding a bayonet on the left side of the sign.